Benevo Rumble Strips | For Pets | Plant Based Life | Eat Better Live Better! 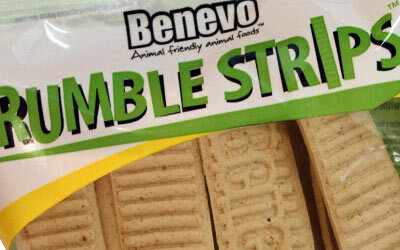 Benevo Rumble Strips – Soft chewy vegan treats for dogs. Pack of 20 with resealable label. Perfect for giving a little reward or treat. Cruelty-Free: Benevo products are not tested on animals or produced with slaughter-house or animal ingredients. Whats in Benevo Rumble Strips? I use this a training treat when I walk with the dogs, or to get their attention if we are out and about on a big field or at the beach. A little motivation to listen to ‘mommy’. They can sniff these treats from a mile away and almost swallow it whole as they love it so much. It lasts very long in the fridge, and works great to break into pieces and store in a moonbag if you are out walking with the doggies. It is dry, but soft, and not messy at all. Also doesn’t crumble or fall apart, so you can give it to the dogs while walking without stopping.